A group of three railroad companies were formed to construct a line from Pittsburgh westward into Ohio as a rival to the Baltimore & Ohio. In 1849, the Pittsburgh & Steubenville was incorporated to construct the portion to the Virginia (now WV) line [see Kobus for more info]. The line was completed in 1865 including the tunnel under Grant's Hill in downtown Pittsburgh which provided the connection with the Pennsylvania RR. Construction costs and delays resulted in the foreclosure of the P&S and take over by the Pan Handle Railway Co in 1868. Further consolidations led to the formation of The Pittsburgh, Cincinnati, Chicago & St. Louis Railroad which ultimately became the Panhandle Division of the PRR. The P&S RR crossed the Panhandle Bridge and followed the left bank of the Monongahela River on a shelf below Mt. Washington and then along the Ohio River to Corks Run. Passing Nimick Station (today the site of the Corliss Tunnel) the railroad followed Corks Run southward near the farm of William Sheraden. The P&S RR passed the speculative plat of Aschenaz (The borough was incorporated in 1894 as Sheraden. The station and post office were renamed Corliss by the PRR in 1918 because there was already another station named Sheriden.) and entered the 1865 Cork Run Tunnel. 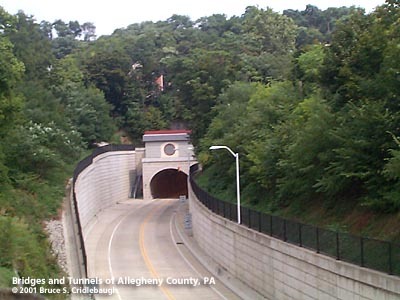 One of the newest tunnels in Allegheny County is a rebuilding of one of its oldest. In 1998, a $37.1 million contract was awarded to Mosites Construction Company to rebuild the (former Panhandle Div.) Berry St Tunnel in Sheridan. This was Mosites first major tunnel construction project. The project involved the widening and extension of the tunnel and the installation of lighting, ventilation, fire protection and drainage systems. The Cork Run Tunnel was bored in 1865 as a 12-foot-wide single track tunnel; it was widened to 25 ft in 1873 to accommodate two tracks. The Busway project called for the tunnel to be bored to a width of 30 feet for a two-lane bus only roadway. The winning bid of Mosites was lowered $2 million by the revisions offered by Dr. G. Sauer Corporation of Virginia. Because the Port Authority restricted the use of blasting, and because of the nature of the geology ("medium hard to soft sandstone and shale with thin beds of coal and claystone and a 130 ft. section [at the north end] of the tunnel...through the non-cohesive fill of the original cut and cover section"), Sauer employed the New Austrian Tunneling Method (NATM). NATM uses the application of shotcrete -- concrete plus admixtures sprayed onto excavated tunnel surface -- to enhance the stability of the exposed rock while minimizing the amount of rock bolting, grouting, and heavy framing. A lighterweight lattice girder system is installed as the tunnel heading is excavated. Steel mesh and rebars are added to carry and reinforce the sprayed layer of shotcrete. Admixtures combined with the concrete included steel fibers which added to the flexural strength of the concrete lining. Spiles and rockbolts are inserted to stabilize the rock as needed. Once the initial support system was installed, a waterproof membrane was added, followed by a cast-in-place final concrete liner. Most of the tunnel was approved to be constructed using NATM, but the northernmost 295 feet were specified to be built using the cut-and-cover method. In this section, plans were modified to build the 95 feet plus a 500 foot extension by constructing a girder canopy similar in design to the girder system used in the NATM. This is noted as the longest NATM canopy in North America. The remaining section of just under 200 feet was completed by cut-and-cover. Excavated bricks from the original tunnel lining were used in the construction of the Sheraden and Idlewood stations. Port Authority of Allegheny County; Dr. G. Sauer Corporation; Kobus and Consoli, "The Pennsy in The Steel City" and "The Pennsylvania Railroad's Golden Triangle"; DeDe Palombi and Diane Smihal, "History of Sheraden"